While overall funeral costs are increasing year on year, hearse and limousine fees are usually included in funeral director package fees and have remained relatively stable. Funeral directors will charge a single rate for an entire funeral service, which usually includes administration, burial costs and the transfer of the body and family members to the cemetery. Limousines aren’t essential – you can use your own means of travel – but for traditional burials most funeral directors will insist on a hearse for transporting the deceased. This article explains some of the costs involved in hiring a funeral car and the different types of car available. There isn’t just one type of hearse. Depending on the wishes of the deceased, their interests or hobbies, you could opt for something more personal. The hearse is the most traditional type of funeral car. 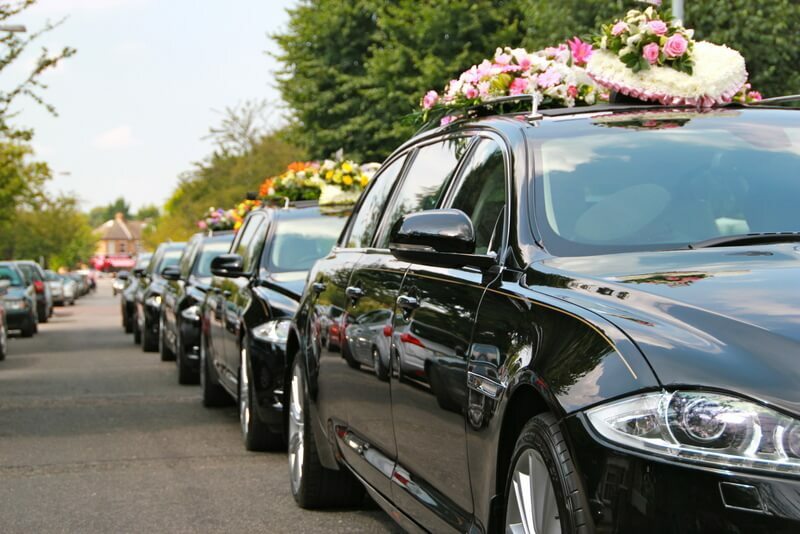 Funeral packages usually include a hearse and a limousine as standard, with additional cars costing extra. These long, glass sided estate vehicles are specifically designed for carrying coffins and are the most popular option due to their cost effectiveness and the availability. Traditional and Cadillac style hearses cost around £300 or more depending on the age of the vehicles and reputation of the hire company. You may decide to opt for something a little more unique and go for a horse-drawn hearse. These are more expensive and cost roughly double that of a tradition hearse. Motorcycle hearses are also becoming a more popular option. These uniquely designed motorcycles feature a large side-car for transporting the casket and are popular among motorcycle enthusiasts, often followed by a large motorcade of the deceased’s biking friends. Some funeral directors will also provide novelty cars, as well as traditional vehicles. Anything from fire engines to famous vehicles from television shows can be booked either for transporting the coffin or family and friends. This is a lot less common, but it is gaining popularity as funerals are becoming less solemn and more of a celebration of the deceased’s life. While the price of novelty cars fluctuates significantly depending on the provider, expect to pay at least the same as you would for a luxury limousine. The limousine is often reserved for family and close friends and can usually accommodate 7-9 people. Traditionally, for parental funerals, two limousines are required – one for the grandchildren and one for the children of the deceased. The costs of the additional cars depends on the type of car. Standard, Lincoln-style limousines will be a similar price to the hearse, whereas people carriers can cost significantly less at around £100. There is always the option of taking your own transportation, but all funeral car hire firms will provide a chauffeur in the price of the limousine so family members do not need to drive. In an effort to reduce costs, many families reserve the main limousine for close family and friends and a people carrier for everyone else.